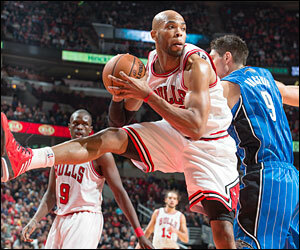 Taj Gibson took a walk in Derrick Rose’s shoes the other day, and it didn’t feel too comfortable. Gibson suffered a recurrence of his sprained MCL and left Tuesday’s loss to Washington in the first half when his knee buckled. Everyone feared a serious setback, though Gibson said the exam showed an issue with healing scar tissue which coach Tom Thibodeau called a slight sprain. Gibson is out for Thursday’s game against the Nets. He didn’t say when he might return, though he did say he intends to play again in the regular season. The informal estimate sounded like he could be out about a week. So he joins Joakim Noah and Marco Belinelli likely also out Thursday (Thibodeau said, “We’ll see.”) along with Richard Hamilton and Rose. Noah and Belinelli are considered close and could play any day now. Hamilton has indicated he would try to play in the regular season and perhaps could play next weekend. Rose, of course, remains uncertain. So immediately, the Bulls could use Malcolm Thomas or Vladimir Radmanovic for spot minutes. Though given the trends it would be more likely the Bulls would play a smaller lineup longer with Luol Deng at power forward along with extra minutes for Carlos Boozer. The Bulls currently are sixth in the Eastern Conference, though just a half game behind Atlanta. The Nets are fourth, two and a half games ahead of the Bulls. So Thursday’s is a potential playoff preview as the Nets seem likely to be fourth or fifth in the East. They won in Cleveland Wednesday night without injured starters Joe Johnson and Gerald Wallace. Though they have big men reserves in Andray Blatche and Kris Humphries along with robo rebounder Reggie Evans, which makes playing small more difficult against them. But it seems unlikely the Bulls could fall to eighth now with Milwaukee with five more losses. The way playoff matchups go, if you are sixth or seventh you avoid the top seeded team if you get that far until the conference finals. The Bulls issues, though Thibodeau is not one to ever maneuver to seedings and matchups, is the Bulls probably matchup best—assuming everyone injured but Rose plays—with Brooklyn. But if you are sixth or seventh, you aren’t in the bracket with Miami until the conference finals and the Bulls have had success against both Indiana and New York, though the Pacers won the season series this season. 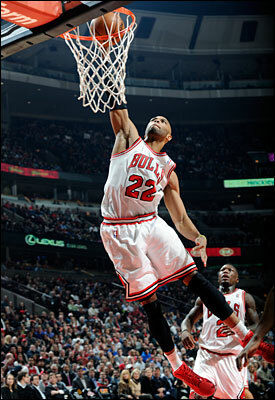 But also given Gibson’s scare coming back a bit too soon in his view was the thought about Rose. Anything can happen, Gibson’s experience suggested, when you are not fully healed as Rose is not now. After all, if Rose were he wouldn’t be on a minutes limit if he returns, which he would be. And anything did happen to Gibson. So he’s taking a step back for now. So now Gibson is injured, though he says given the positive MRI he will analyze his pain and marry that with a bit of caution as he moves forward. “My mindset when I first came back (was to play with pain),” Gibson said. “I knew we were sliding down the pole almost close to the eighth spot. I wanted to come out here and help us get some wins and bring a little energy from being in the back seeing the games to where I see them. “What happened to me shows that I came back a little too quick,” said Gibson. “I think now I’m on the right track moving forward. I’ll see how I am feeling. (Yes), it could happen again. I have to have my mind ready and have my body prepared for the outcomes because I know we’re making a playoff push and everyone is needed right now. “I don’t plan on trying to be out a long time,” said Gibson. “It depends on how I’m feeling. It’s sore right now. It could be less sore tomorrow. That’s how the knee works. Basically everything got healed up. But the scar tissue got tangled up in there and that was the most painful part. “They told me with the ligament repairing itself, they said the scar tissue, once it gets knocked around… it would be weak and when you rush back they told me it would be painful and might be a little weak,” Gibson added. “But I never thought it would buckle on me like that doing something so simple.